As technology evolves, people who conduct business continue trying to keep up, implementing it in all facets of their industry to improve and increase efficiency. Whether these technologies have been around for some time and developed, or they were recently introduced and applied, there’s no doubt they’re revolutionizing commerce. With that said, here are six tech trends that’ll change how people conduct business in 2014. Increasing Business Intelligence of Their Consumers – By accessing and taking advantage of information from several sources, everything from purchase histories and information from your industry partners to unstructured information like social media, blog posts and even online videos. Businesses are being able to learn every facet of their customer lives to improve service and overall customer satisfaction. Increased Operating Efficiencies – Machines, everything from cars, planes to assembly line machinery are producing vast amounts of information, for example a single a Boeing jet engine produces 20 Terabytes of information every hour of flight, these types of copious amounts of data collection are leading to predictive analytics that have never been see before. This will enable this like planes to determining their own maintenance schedules and supply chains to be able to supply different stores with the correct products at the right times. Big Data Analytic Services – With the massive increase in volume of all of this customer data available to be used, it can be next to impossible for a SMB to have all the resources (large servers, analytical data scientists, etc.) to be able to collect, analyze and digest all this information. However with the emergence of big data and analytic services, that do have these resources and capabilities, companies of any size will be able to use the same big data tactics effectively to their advantage, without having to stray away from their core business operations. Clouding computing is one of the fastest growing technologies on this list, with a prediction that U.S. businesses will spend more than $13 billion on it by the end of 2014. Gartner suggests that with the increased usage of networks, the cost of them, the ability to manage bandwidth and the increasing power and capability of new mobile devices “creates incentives, in some cases, to minimize the cloud application computing and storage footprint, and to exploit the intelligence and storage of the client device.” Consumers will continue to expect more complex and advanced ways to use their mobile devices, which will greatly increase the demand for server-side computing and levels or data storage. Three-dimensional printing became highly popular in 2013, and 2014 will be the year that this (now) cost-effective means of production will begin to have a widespread effect on business. Growth and demand for 3D printers is expected to increase by 75% in 2014, further integrating deeper into business processes and production. According to this Wall Street Journal article, U.S. executives worry about the costs associated with manufacturing goods in countries like China. With that in mind, it’ll be less appealing for companies to conduct business overseas considering those costs. Although 3D printing won’t reach its full potential in 2014, it’ll start to have an effect on business and production in the U.S, with even faster growth expected in 2015 by 200%. The business world is moving beyond the era of standalone devices into one where everything connects, everything from TV’s, watches, refrigerators, cars and more together. 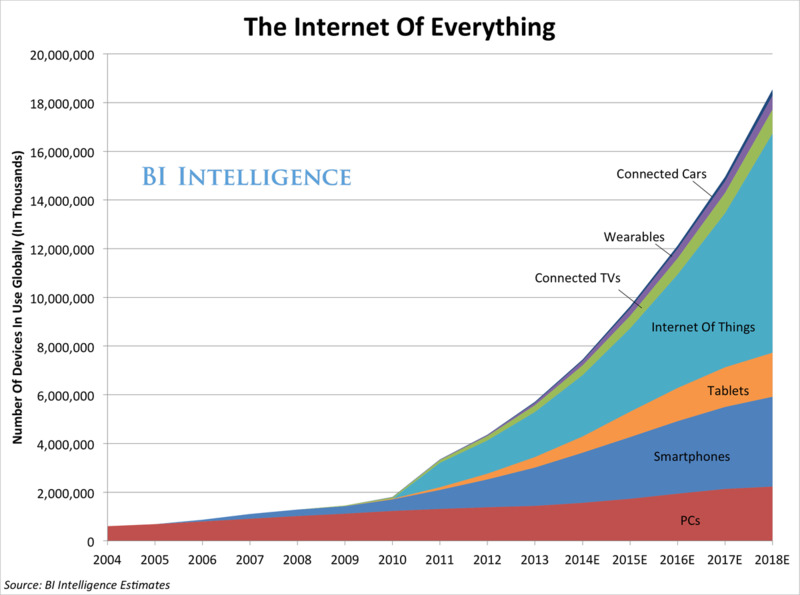 If you look at this chart that highlights the advancement of the Internet of Things technological movement, you’ll notice that 2014 is when the ascent into widespread popularity takes place. These models can be applied to most things, from people to information, places and more, hence the Internet of everything. As long as business people have an Internet connection to a service provider like Verizon, smart devices offer them the flexibility to communicate with customers and conduct transactions on the go. Although devices like smartphones and tablets continue to lead the way in 2014, providing a wealth of mobility options and increasing productivity as a result, the future in smart technology is in machines. According to this insightful article, Gartner predicts that smart machines will have a widespread impact in business through 2020 — and it starts in 2014. BYOD has slowly been gaining traction in recent years, but it’s expected that 2014 will finally be the year when companies go mobile. Essentially, this tech trend allows personal mobile devices to connect to company networks. Although there are some security risks involved with the program, the biggest benefits include company savings and increased employee productivity. As more people purchase smartphones, you can expect this trend to skyrocket as companies implement safeguard policies and take advantage of this technological trend. These six emerging tech trends are just the tip of the iceberg as far ones that are changing business. With many companies striving to innovate the next big thing, there’s no telling where we’ll be in just 12 months from now. What other tech trends have you noticed that are changing that way people conduct business? Most times SME companies need more detailed and localized procedures to function in a global network for effeciency.